Marketing 2 tussentoets 1 16/17 Marketing 2: consumer behavior. Tussentoets 1 (H2 t/m H6). 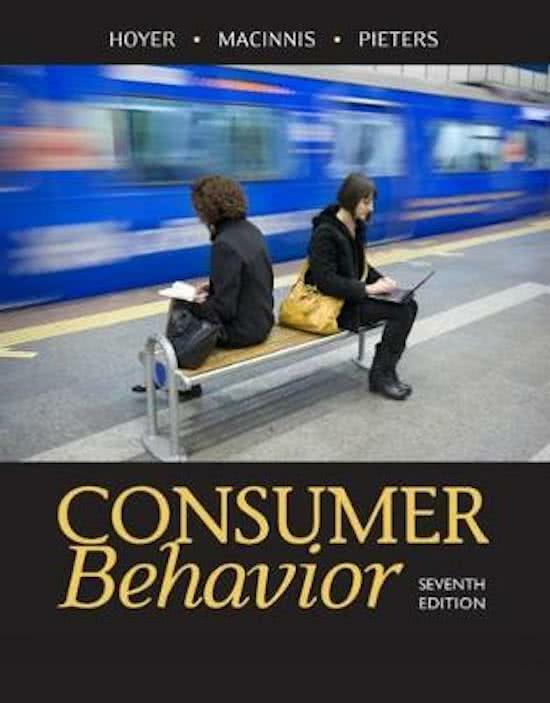 Chapter 2 - 6 Consumer Behavior Seventh Edition Consumer Behavior Seventh Edition. Summary in English of part 2: the psychological core. Chapter 2 t / m 6. With all the concepts chapter overview, models and examples. Consumer Behavior (7th edition) CH11 t/m 14 (Part 4) Summary of Chapters 11 through 14 (Chapter 11-14), which return as knowledge questions on the final test of Marketing (pre-master). Terms are clarified with examples. Consumer Behavior 7th edition - chapter 2 t/m 6 It is a summary of Chapters 2 through 6 of Consumer Behavior 7th edition of Hoyer, Macinnis and Pieters. It is a comprehensive summary in which the terms / definitions are written in English, with Dutch translations and examples. Uitgebreide samenvatting Consumer Behavior 7th edition hoofdstuk 7 t/m 10 - Marketing (for premaster) A comprehensive summary of chapters 7 through 10 for the midterm of the Marketing (for premaster) course of the book Consumer behavior - Hoyer, Macinnis, Pieters. The summary also contains examples (clearly identifiable) and marketing implications (clearly recognizable). In addition, the summary has been supplemented with a few points from the lesson and checked with the help of other summaries to actually present the essence of these chapters. In addition, some difficult words have been translated into Dutch to clarify the substance. ATTENTION ! : at 8.3a cognitive model must be conjunctive model! Summary consumer behavior ch. 1-14 A summary of the book Consumer Behavior from Hoyer, Pieters & MacInnis, the seventh edition, chapters 1 - 14. Summary Marketing - Premaster Marketing Management Summary of the course Marketing for Premaster Marketing Management. The summary is based on the book Consumer Behavior by Hoyer, Macinnis and Pieters and consists of part 2, 3 and 4. In other words, all the material for the examination. Oefenvragen voor deel 3 - Marketing voor pre-master Marketing Management Practice questions from chapter 11 to 14 of Consumer Behavior. Aantekeningen hoorcollege's Henk Roest - Marketing for Premaster. Marketing Management Notes from Henk Roest's lectures so far. Notes were made during the lectures and otherwise not ordered or checked for spelling, but complete. Both English and Dutch. Multiple choice examen-vragen Marketing for pre-master INCLUSIEF ANTWOORDEN Practice your marketing exam with these multiple choice questions from old exams! (24 in total). Tip: the more you practice with existing exams, the better you perform. På denne side finder du referater, notater, studieguider og meget andet for studiebogen Consumer Behavior, skrevet af Wayne D. Hoyer & Deborah J. Macinnis. Referaterne er skrevet af de studerende selv, som giver dig et godt indblik i hvad der er vigtigt at studere i denne bog. Emner som consumer behavior, marketing, Marketing, Consumer behavior, marketing management, hoyer, macinnis & Marketing 2 tages der god hånd om.